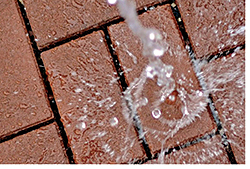 Composite 4- by 8-inch permeable pavers reduce the volume and velocity of stormwater runoff by infiltrating 4.9 gallons of rainwater per square foot per minute, when installed with aggregate conforming to ASTM D448 No. 8. The pavers are manufactured in an engineered composite material that includes 95 percent post-consumer recycled rubber and plastics. The composite material is more giving and forgiving than hard, abrasive surface of concrete pavers, making the pavers a safer and more comfortable surface. They also provide slip resistance and are manufactured with spacer lugs.